The rooms above Joe Murphy’s Menswear have had many uses over the years, initially serving as offices and accommodation for the British army until the early 1900’s, and then as a family home. When the building was bought by the current owners family in 1952, the Square Townhouse space was used as a mix of storerooms and guest rooms – often a sales rep on the road would get a room upstairs in lieu of a discount, but may have had to share the room with stock from the thriving menswear shop downstairs. Continuing with the tradition of utilising the space above the shop – the Square Townhouse as it’s now known was born in 2016, offering the best of both a ‘Hotel and Airbnb’ according to the buildings new owner, Ray Murphy. The Square Townhouse accommodations, which Ray describes as “beautifully decorated and spare” are part of a lodging industry experiment that he relaunched, in the memory of his father, Joe Murphy. 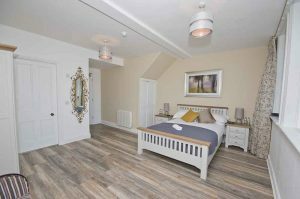 The Square Townhouse Fermoy has been successful in combining the reliability of a hotel with the practicality of a rental. Ray actually recalls the rooms over the shop being used as ‘reps’ rooms before the internet was invented, in effect the Square Townhouse was the worlds first Airbnb 30 years before the internet, and 60 years before Airbnb was formed. The accommodation continues to find a space between hotels, with their standardized list of amenities and services, and home rentals, which can offer more privacy and space and, often, lower cost. With many horror stories emerging from room-sharing websites, it’s no wonder that Professionally-managed rentals like the Square Townhouse Fermoy have emerged to address the inconsistency that tourists can encounter between properties. The accommodation provider represents one of the most organised efforts to date to fix the problem, some guests already seem to be thinking differently about where they are going to stay. It’s an idea that may be of benefit to you when you look for hotel or self-catering options in Fermoy, whether for business or leisure. “Like being at home, only better” was how the property was described by one guest, who was working as a contractor locally, and didn’t fancy being stuck in a stuffy hotel room. The accommodation came with everything she would want in an apartment, such as modern appliances, but was as well maintained as a hotel. She didn’t have to call the front desk, but if she had to, Ray and his staff are located downstairs in the popular Fermoy clothes shop. The on-site staff address some of the rental industry’s shortcomings by ensuring each bathroom is fully stocked with hotel-like amenities, such as shampoo, conditioner, soap, and body lotion. The Square Townhouse’s kitchen include a minimum complement of pots, pans, plates, and place settings, plus a microwave, stove, and complimentary tea and (Nespresso) coffee making facilities. The Square Townhouse is also equipped with fast, reliable Wi-Fi with speeds of at least 50 Mbps, and at no extra charge. Contact us to make a booking.